Sometimes you may encounter an ISO file or archive, like zip or rar, that you want to access directly, without burning it to a disk or unpacking it to the hard drive first. A basic example; Say you have a movie on your hard drive in ISO or RAR format. Instead of having to burn it first / unpack it, you could simply mount the movie to watch it directly. Movies are obviously just an example, the same is true for applications, games, music and any other file format available that comes as an archive or disk image. WinArchiver Virtual Drive is a free software for Windows that supports a wide variety of archive and image formats. Among the most popular formats are rar, zip, 7z, iso, bin, mdf, img, nrg, tar, gz and dozens of other archiving and disk image formats. The software can install multiple virtual drives (up to 23!) in Windows which can then be used to mount the disk images or archives. 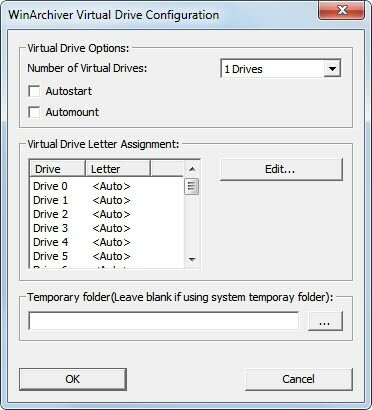 Each drive is listed with its own drive letter in Windows Explorer. Archives and disk images are mounted with a click on the application's system tray icon and selecting the Mount Image to drive letter option. This opens a file browser to select the archive or disk image format from the hard drive. Virtual drives are unmounted the very same way. 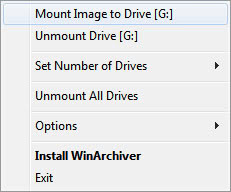 WinArchiver Virtual Drive can autostart with Windows, and automount archives as well which is handy for mounting images or archives that are needed regularly. The program is on most regards very similar to the popular alternative Daemon Tools Lite, but there are a few exceptions. Virtual Drive supports more formats than Daemon Tools, and it can create more than four virtual drives. WinArchiver Virtual Drive is available for download at the developer website. It is compatible with 32-bit and 64-bit editions of the Windows operating system. Really nice find, I have only a few complain that I can’t mount CD Audio or cue/bin (with cd audio tracks) properly. I hope they fix this bugs, because this soft look nice so far. I disagree, Gizmo Central is a suite of tools not only for ISO/Image mounting, also it is bloat with skins and things like that, it is very buggy too, I don’t recommend it. WinArchiver is trash. They promote it by distributing proprietary ISO files that can’t be opened without their commercial product.